In marketing, brand equity refers to the value of a brand and is determined by the consumer’s perceptionAIDA ModelThe AIDA model, which stands for Attention, Interest, Desire, and Action model, is an advertising effect model that identifies the stages that an individual goes during the process of purchasing a product or service. The AIDA model is commonly used in digital marketing, sales strategies, and public relations campaigns. of the brand. Brand equity can be positive or negative. If consumers think highly of a brand, it has positive brand equity. On the other hand, if the brand consistently under-delivers, fails to live up to consumer expectations, and generates negative word of mouth, it has negative brand equity. Simply put, brand equity is the reputation of a brand. Companies can charge a premium for products with lots of positive brand equity (think of designer brands). Positive brand equity can be transferred to a different product line, which in turn increases salesSales RevenueSales revenue is the starting point of the income statement. Sales or revenue is the money earned from the company providing its goods or services, income and revenues for the company. Positive brand equity increases market shareTotal Addressable Market (TAM)Total Addressable Market (TAM), also referred to as total available market, is the overall revenue opportunity that is available to a product or service if as the brand is widely known, recognized, and preferred by consumers. An example of a brand with high brand equity is Apple. Although Apple or the company’s products are very similar in terms of features to other brands, the demand, customer loyalty, and company’s price premium are among the highest in the consumer tech industry. Apple ranks consistently as one of the most valuable brands in the world. Apple’s brand equity is valued at upwards of US$250 billion. The concept behind Keller’s Brand Equity Model is simple – to build strong brand equity, you must shape consumer perception of the brand. The right type of experiences must be built around the brand to generate positive feelings, beliefs, opinions, and perceptions about it. Step 1 is to create a brand that stands out – a brand that customers recognize and are aware of. It is important to ensure that the brand’s perception by consumers aligns with how you want your brand to be perceived. Step 2 involves creating brand meaning. The two building blocks in this step to create brand meaning are “performance” (what your brand means) and “imagery” (what your brand stands for). Performance refers to how well the products or services meet customers’ needs. There are five categories: (1) primary characteristics and features; (2) product reliability, durability and serviceability; (3) service effectiveness, efficiency, and empathy; (4) style and design; (5) and price. Imagery refers to the ability of your brand to meet customer’s needs on a psychological and social level. For example, companies that are committed to “going green” attracts and builds loyalty from customers who identify with and support the company’s value. US clothing retailer Patagonia’s brand performance involves reliability and durability – customers acknowledge that the products are well designed, stylish, and meets their expectations. The company’s brand imagery is its commitment to environmental programs and social causes. Patagonia’s customers feel good knowing that they are purchasing products from a company that takes into consideration its environment. Quality: The perceived and actual quality of a product/service. Credibility: The trustworthiness, likability, and expertise (innovation) of the brand. Consideration: The relevance of a product/service to a customer’s needs. Superiority: The superiority of a brand compared to other brands. Customers also respond to a brand in accordance with how it makes them feel. Brands can evoke feelings such as warmth, fun, excitement, security, self-respect, etc. Step 4 involves building a deep customer relationship. This step is the most difficult to attain, and it means that the customers have formed a deep connection with your brand. This can be through repeat purchases, attachment to your brand or product, actively engaging as brand ambassadors, attending events, or following your brand on social media. In essence, brand resonance is the connection that customers have with a brand. Colin is the marketing manager for a company that sells coconut water. Although the product is high quality, fair trade, and healthy for consumers, the company has never been able to generate significant sales or acquire loyal customers. 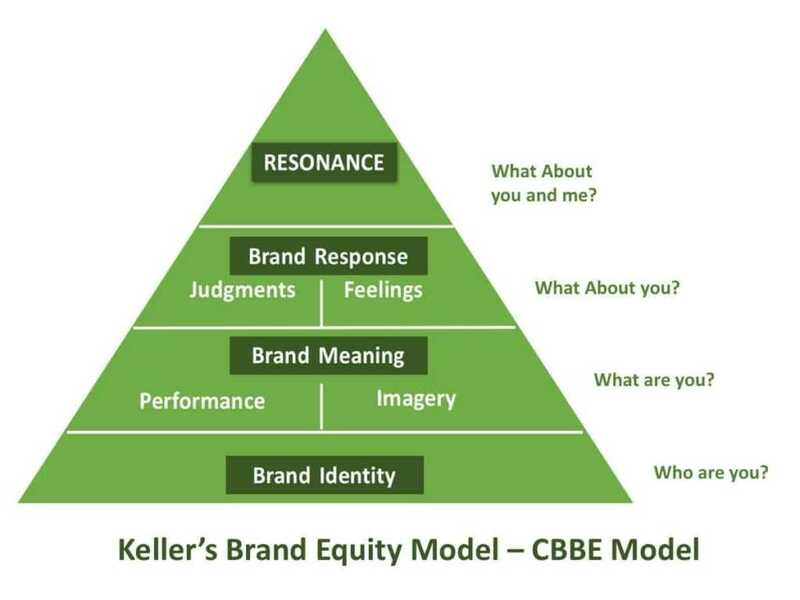 Colin decides to consult Keller’s Brand Equity Model to try and build brand equity for the company’s product. Colin identifies what the brand means to its consumers. Colin concludes that the performance of the coconut water is high. It is a fair trade coconut water that is of higher quality than competitors. Also, the product is significantly healthier than its competitors and is priced competitively. However, the product’s brand imagery is low. The brand does not meet customers’ social need and the awareness of fair trade is not apparent. Colin decides to utilize social media and post fair trade stories about the workers who help harvest and make the coconut water. By doing so, Colin hopes that customers will realize the impact they are making to workers in developing countries when they purchase the company’s coconut water. Colin examines the brand response judgments and concludes that the perceived quality of the brand is not up to par. Although coconut water itself is of high quality, the product is poorly packaged and lacks innovation. Therefore, Colin decides to consult with the R&D department to develop an innovative package to improve the product’s perceived quality. To build brand resonance, Colin pushes the brand’s imagery of fair trade. Colin decides to create several initiatives with the help of social networks to involve customers in the company’s fair trade efforts. Among other things, Colin decides to host several fair trade events around its community and create a social media page dedicated to discussing issues regarding fair trade.